Hors d’oeuvres served piping hot out of the oven add elegance and sophistication to any event. 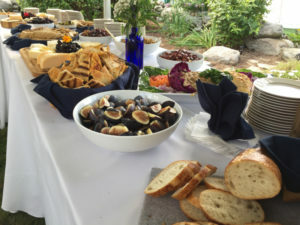 Our catering specialist will be happy to recommend the perfect variety and quantity for your guests. 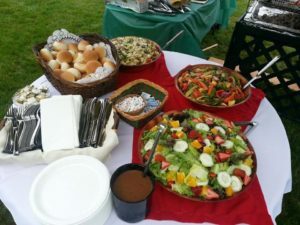 Hot & Cold Buffet – The easiest way to plan your party!!! Includes: Hot food trays, salads, subs, and a pickle / olive tray. Only 16.99 per guest. 20 guest minimum. Add an upscale air of sophistication with one of our rich and delicious seafood entrees. Lasagna sheets layered with shrimp and scallops with a creamy seafood sauce. Individual filets stuffed with fresh spinach and mushrooms. Topped with a fresh lemon sauce. Whether you’re serving a vegetarian crowd or looking for a traditional Italian pasta entree, this is the place to look. Available in 10″ x 12″ pans which serve about 10 – 12 people and 12″ x 20″ pans which serve about 20-25 people. Whether or not you’re a “real” man, you’ll love our quiches. They’re great for a Sunday brunch or a light summer dinner. Feel free to mix and match ingredients to create your own special quiche. No matter how many entrees you choose, you still need a few sides to round out the menu. Choose from our extensive menu of rices, potatoes, vegetables, and salads. Grilled Vegetables are presented on garnished platters and served at room temperature to retain their crisp taste and appearance. These salads are terrific as an entree or side salad for a summer luncheon or any other time you’re looking for something light and different. As always this is just a small sampling of what we offer. Be sure to ask our catering specialist if you’re looking for something unique. We love to be challenged. All of these chicken salads are 9.99 per pound. About 3 servings per pound. All of these salads are 6.99 per pound. About 4 – 5 servings per pound. All of these salads are 8.99 per pound. About 4 – 5 servings per pound. Premade Sandwiches on Rye, Wheat, or Rolls – Priced per sandwich. Please ask for details. The following items are presented on garnished platters. When your entertaining a crowd, nothings better than our subs. Lots of varieties, easy to eat, and very economical. We use only Boar’s Head cold cuts. 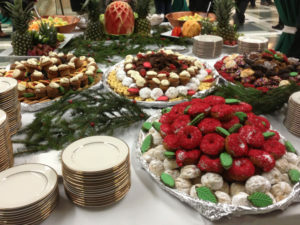 Desserts – All terrific endings to your event. 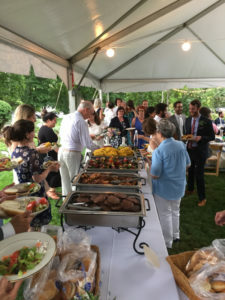 Please call to schedule your event or get more information 845-621-0696.